There are three kinds of people in this world, according to Kelly O’Keefe: Sheep, predators, and sheep dogs. He says you don’t want to be a sheep because sheep are followers. And you don’t want to be a predator. Instead, he says, be a sheep dog because you’ll help the rest of the herd. 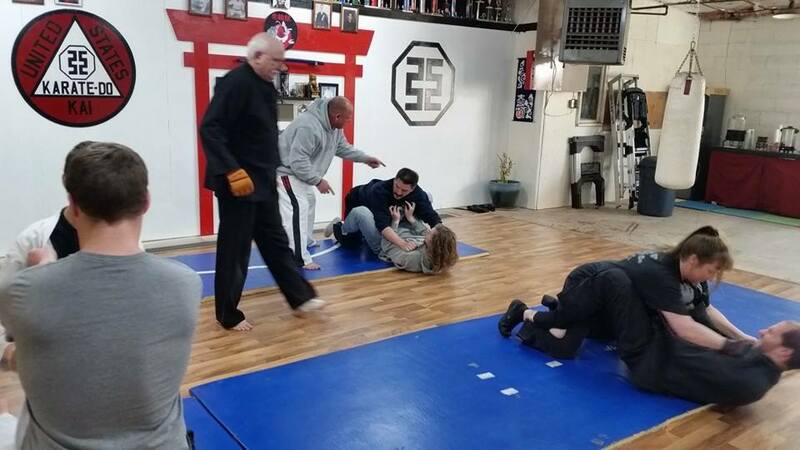 Mr. O’Keefe taught a krav maga seminar today at Tora Hakutsuru Kan Martial Arts Academy in Morton. 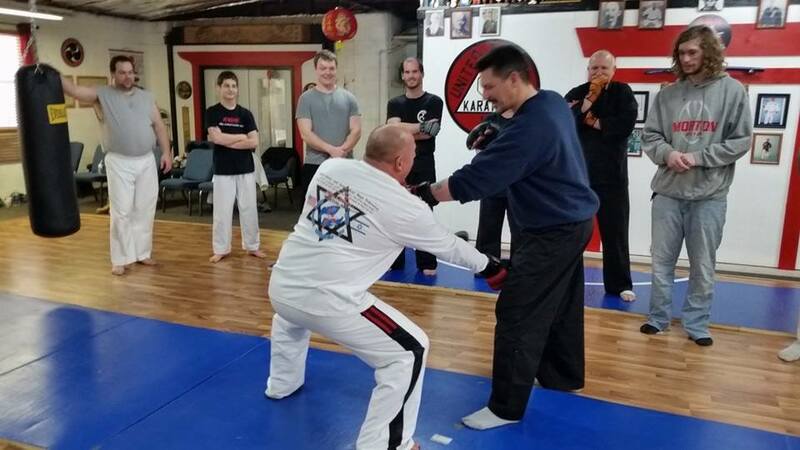 Krav maga, he says, is a martial art the Israelis developed from other empty-hand self-defense systems. 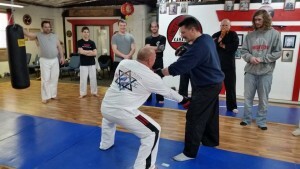 Some of the more advanced techniques are unique to krav maga, but he said advanced martial artists shouldn’t see anything they really hadn’t seen before. 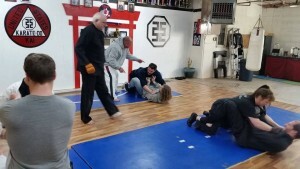 Since I didn’t know anything about krav maga, I expected to come to class and learn some funky new martial art like I seem to at almost every other seminar I go to. But, it wasn’t clear to me where “krav maga” started and stopped and other martial arts came into play. And I think that’s by design. What I mean by that is some of the drills that we did. He taught us what he called a “burst,” advocating to strike two techniques in succession – for example, execute two back-to-back strikes to the eyes in case one misses. 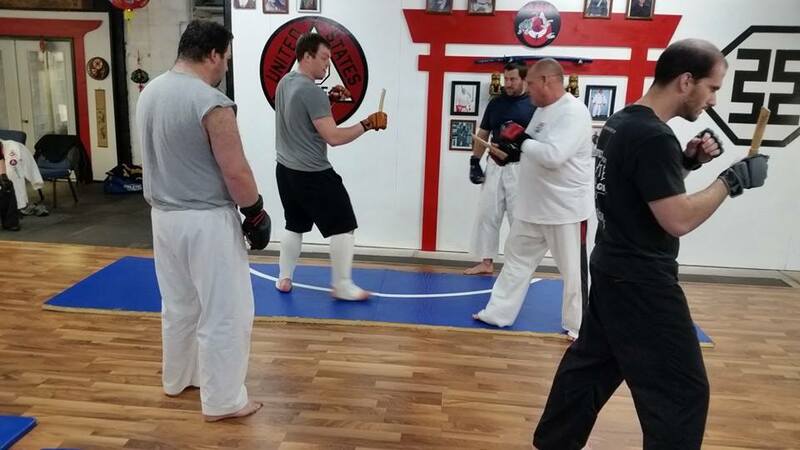 He taught a few sparring combinations that looked like kickboxing. He taught us how to get into a guard position, and then how to escape from the guard position into a mount. In other words, none of what he taught was unique to krav maga. They are all things you can find in other martial arts. 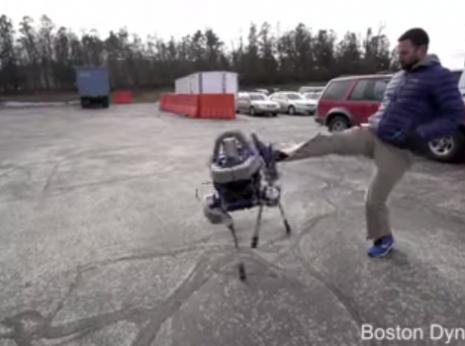 The creators of krav maga, he said, just took what worked and discarded the rest. The most enlightening portions of the day to me were working sparring with knives and disarming an attacker of a gun. Mr. O’Keefe is also a law enforcement officer, and is proficient in both areas. Knife sparring is something I’ve only ever come into contact with in the abstract, but I’ve never held a wooden knife (in this case) and tried to cut anybody with it. When you get hit with the knife, it makes you think about how often you’re really getting cut. The disarms against a gun were new for me, too – again, it’s all been abstract thought to this point. In another blog for another day, I’ll explain the inner conflict I’ve had about concealed carry since it became legal in Illinois – some might say I’m just not accepting reality. It was fairly obvious from those around me, though, that I was embedded in a group of people that heavily favored concealed carry. Mr. O’Keefe, who has certified hundreds of people for concealed carry of a firearm, taught several ways to disarm a would-be attacker of his gun. It was also interesting to hear some of the legal ramifications involved, as well. For instance, earlier in the class, Mr. O’Keefe mentioned that if a person balls up his fist at you, you would be able to defend yourself. However, if that same person pulls a gun on you and you disarm him of it and shoot him, you’re not so much defending yourself as you are murdering him. I asked what the rationale was behind that. He said in the first scenario (assuming no weapons are involved), you would think the person is going to hurt you, so you do something about it. In the scenario with the gun, once you take it from him, you become armed against an unarmed person. I had thought because the person had pulled the gun in the first place, that was enough of an act of aggression, but it turns out I was wrong. If he reaches for something or moves toward you, then you can resume defending yourself. Obviously, I am not a trained firearms instructor, nor am I an attorney, so I may be munging some details here. But that’s the gist of what I learned from that situation. I learned to be a sheep dog.